Beautifully designed and stylishly minimalist, these compact coffee cups feel reassuringly weighty. Inspired by Australian café culture, it combines great design with form and function. This 12oz mug is made for a "regular" 230mL or "large" 340mL sized coffee. It features a double walled cup, so your coffee stays hot without scalding your hand (although this is not a thermos mug). It has a push button lid opening which can be operated by one hand and is leakproof when closed. Compared to other travel mugs, this mug is particularly stylish and very easy to hold, it can also be stored in a bag, whether full or empty. It is ideal for commuting in style. 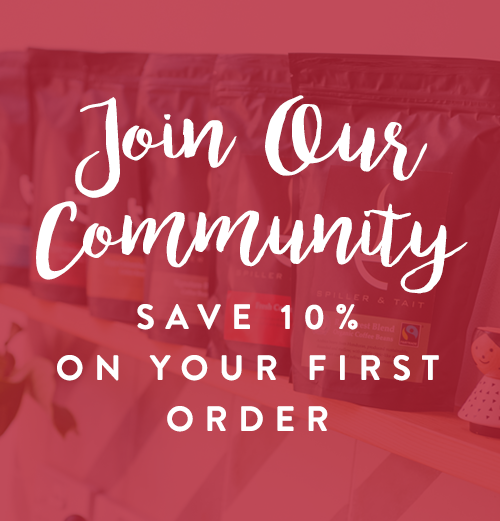 Join our Community and receive a 10% discount on your first order! © 2019 Spiller & Tait Coffee. 10% OFF your first order when you join our community, join here. Can I change the date of my subscription? Please note: By selecting a new date, you will be creating your next order for that date, but there may be up to a 24 hour delay before it is processed. This will also change the shipping date for all your future orders. For example: You currently have a monthly subscription shipping on the 1st of every month. You change the date here to the 15th for your next order. Your future orders will now be created on the 15th of every month. How do I change/view/update my card details for my subscription? Can I update my address? Can I change my delivery method? Can I change the quantity of products I have ordered? Can I see all of my upcoming orders? Can I swap a product I’d like to receive in my subscription? Please note: if you want to swap a product which is a lower or higher cost, you will be be notified in the account area what the difference is and we will adjust the amount we take on your next order. Can I add a product to my subscription? Can I change the frequency of my subscription? Can I skip my next order? Can I use a coupon code for subscriptions? Yes, you are able to use coupon codes for Spiller & Tait’s Subscriptions.